Propolis is a resinous natural product collected by bees (Apis mellifera) from tree exudates which is widely used in folk medicine1. Reports on Jordanian Propolis reveal the presence of new chemical compound 4(Z)-1-3-dihydroxyeupha-7,24-dien-26-oic acid2 along with other compounds like pinobanksin-3-O-acetate, pinocemberin, chrysin3 and lignoceric acid2. The present study was carried out to investigate the fatty acid composition, antioxidant and xanthine oxidase inhibition activity of Jordanian Propolis, collected from Al-Ghour region. The hexane extract of Jordanian Propolis contains different fatty acids, which are reported first time, using GC-FID. The major fatty acid identified were palmitic acid (44.5%), Oleic acid (18:1∆9cis, 24.6%), Arachidic acid (7.4%), Stearic acid (5.4%), linoleic acid (18:2∆9-12cis, 3.1%), caprylic acid (2.9%), lignoceric acid (2.6%), cis-11,14-eicosadienoic acid (20:2∆11-14cis, 2.4%), palmitoleic acid (1.5%), cis-11-eicosenoic acid (1.2%), α–linolenic acid (18:3∆9-12-15cis, 1.1%), cis-13,16-docosadienoic acid (22:2∆13-16cis, 1.0%), along with minor constituents like saturated fatty acids. Antioxidant properties of the hexane extract were determined via DPPH radical scavenging, β-carotene bleaching assay and NO scavenging assay. The extract produced significant antioxidant activity in-vitro. The extract also exhibit appreciable xanthine oxidase inhibitory activity in-vitro. 2. Shaheen, S.A., Zarga, M.H.A., Nazer, I.K., Darwish, R.M. and Al-Jaber, H.I., 2011. Chemical constituents of Jordanian propolis. Natural product research, 25(14), 1312-1318. ISNAD SHAKYA, Ashok K. , KATEKHAYE, Shankar , ORIQUAT, Ghaleb A. , NAIK, Rajashri R. , NAIK, Rajashri R. , PARADKAR, Anant , FEARNLEY, Hugo , FEARNLEY, James . "Fatty Acid Analysis and Biological Activity of Jordanian Propolis". 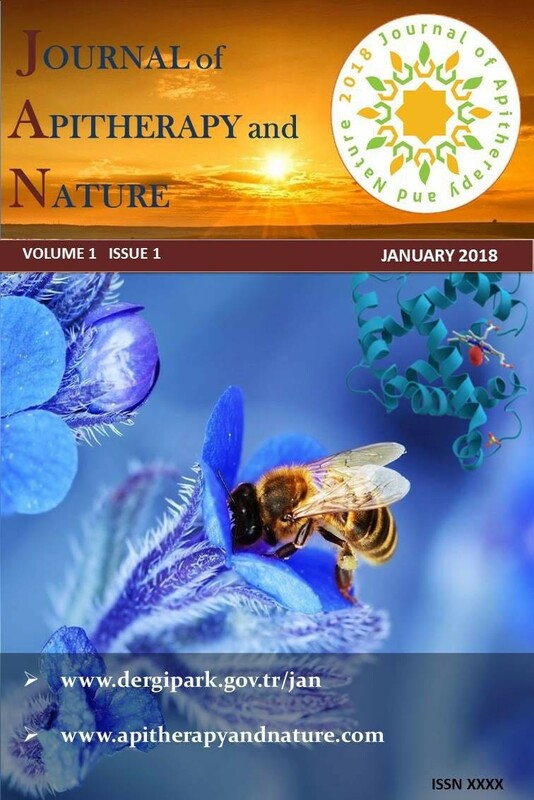 Journal of Apitherapy and Nature 1 / 3 (December 2018): 33-33.